Who is the Gold Award for? The reflection is to be completed at the end of the tasks. On completion of the hours and your personal reflection, you should return your Record Card and personal reflection to the Award leader. 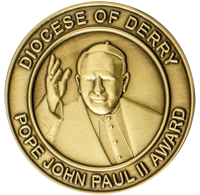 These are ratified by the school principal and forwarded to the Pope John Paul II Award Committee. An answer to the question – What does it mean to you to be a baptised member of the Church?